Concrete is the most used man-made material in the world, encompassing all of the world’s major cities from infrastructure to skyscrapers. However, there are also some inherent limitations with concrete that cause structures to deteriorate long before a satisfactory lifespan. To ensure this doesn’t occur we must create the most durable concrete possible; meaning that it can withstand wear, pressure or damage. Further, besides mechanical damage, water is the foremost predator concrete faces. The ingress of moisture destroys more concrete structures throughout the world than war. Concrete’s durability enhances the ability for resilient construction and sustainable development world-wide. In order to do so, concrete must be effectively waterproofed. There are different methods in doing so; however, construction projects are beginning to lean toward innovative technologies instead of traditional methods. Traditional methods like a surface applied membrane are risky and have many limitations. They are time consuming and costly to install, are at risk for puncture and can be impossible to repair. This is why there is a shift in perspective, moving toward innovative and efficient concrete waterproofing technology. Instead of applying a membrane to the outside of hardened concrete, integral crystalline concrete waterproofing (ICW) is an admixture added to the concrete at batching, making the hardened concrete the waterproofing barrier. 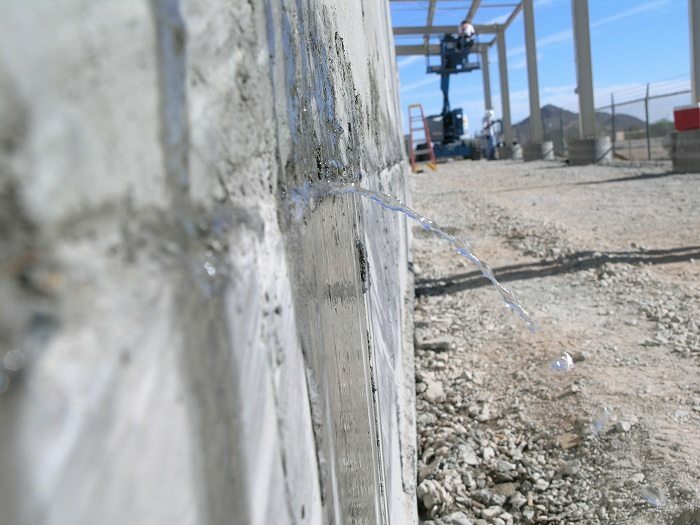 In most cases, concrete without an admixture is expected to develop micro-cracks which allow the passage of water, which decreases a structure’s service life. However, when an ICW admixture is added to a concrete mic, the passive chemicals in the product get activated within the concrete matrix once it comes in contact with moisture in the pores and micro-cracks. • Durability and lifespan improvements. Crystalline technology transforms the concrete into an impermeable a barrier with self-sealing abilities that provide a powerful defense against water damage. Crystalline also reduces the amount of site labor, which is an important aspect of high-rise building, by eliminating the need to install a surface applied membrane. This creates a more efficient and productive jobsite, as well as creates durable concrete leading to a more resilient structure and sustainable structure.